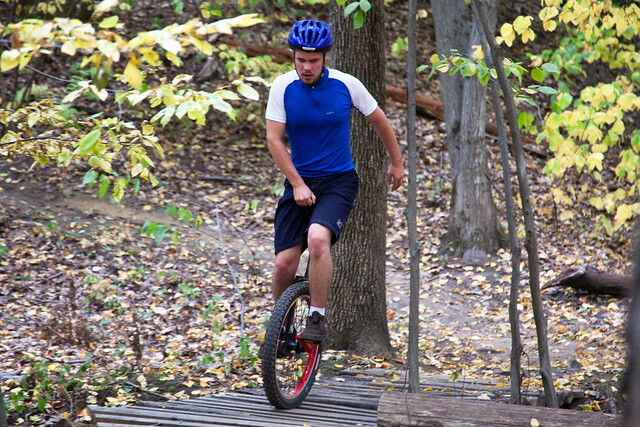 I have a soft spot for unicycles. I remember my first job offer back in 2001, a position in a promising new IT company in Clifton Park. I couldn’t pass on a business that advocated keeping carpal-tunnel at bay by way of yo-yo, juggling, and unicycles, could I? It turned out I have no balance, I left these acrobatics to more adventurous coworkers and practiced dodging pins and pedals diligently. Until 2004 and Rule 2, that is. “ Rule 2: no riding unicycles in the office ” effectively put an end to 3 years of perilous shenanigans. These memories of flying objects and bloody tibias came back rushing earlier this year when I read a curious post on All Over Albany. 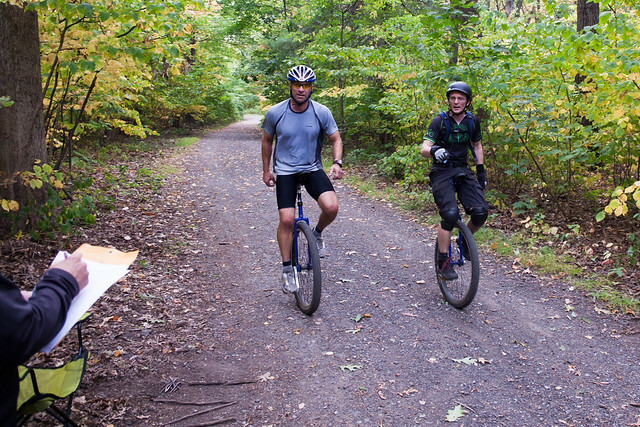 An off-road unicycle race was going to take place on the mountain bike trails in Schenectady’s Central Park. A race. 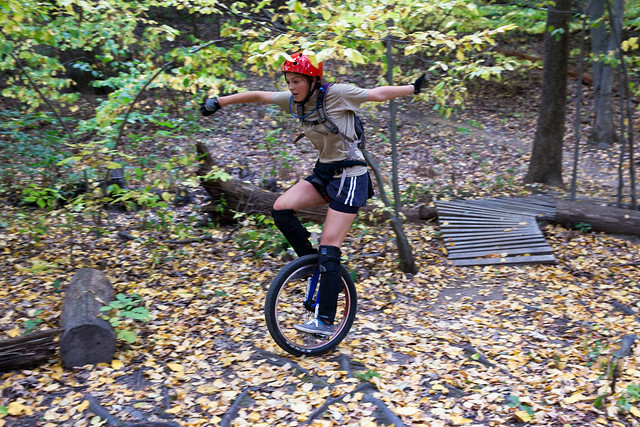 On unicycles. In the woods. Who would do that? The local unicyclists who rode coast-to-coast across Panama, of course. I decided to check these superheroes out. This was a 2 hours race around a 3-4 mile lap course. Most laps in shortest time for the win. 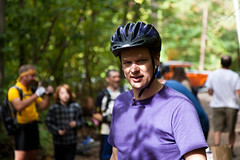 The race started at 10am on Sunday, September 26th. 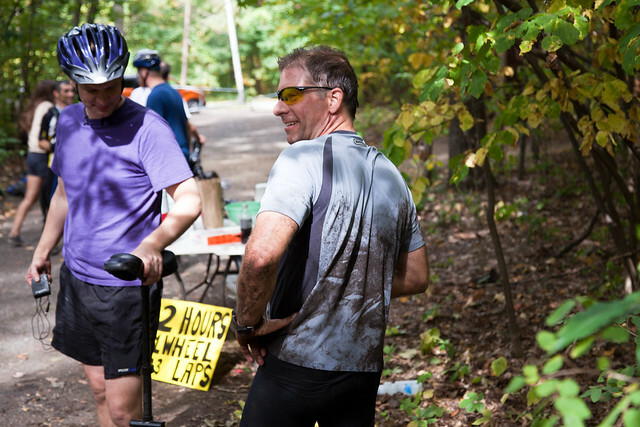 Beginners were anticipated to have fun with 1 or 2 laps while advanced riders would gun for 5 or 6. 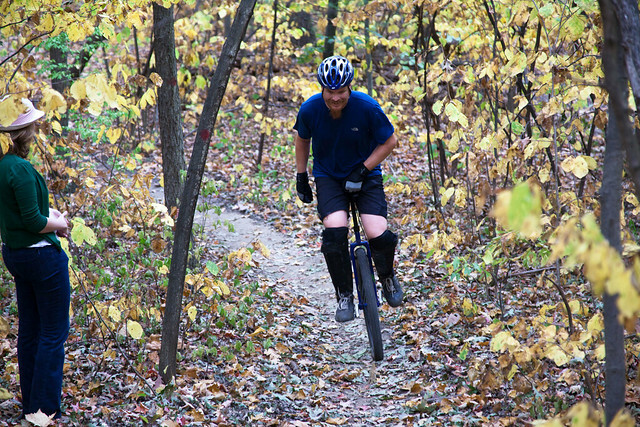 According to the announcement, the trails in Central park are “ a mix of terrain including flowey single track, logs to hop over, boardwalks to ride, and lots of short but steep hills ”. On a unicycle. You read that right. I’m no Spielberg, I don’t use the video feature in my camera remotely as often as I could, but here is a little montage of clips I collected during our escapade in the park. This catchy song, “ Unicycle Ride ”, courtesy of Jason Checkla. More videos later in this post. 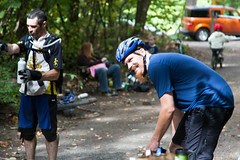 About 10 unicyclists showed up that morning, if I recall. 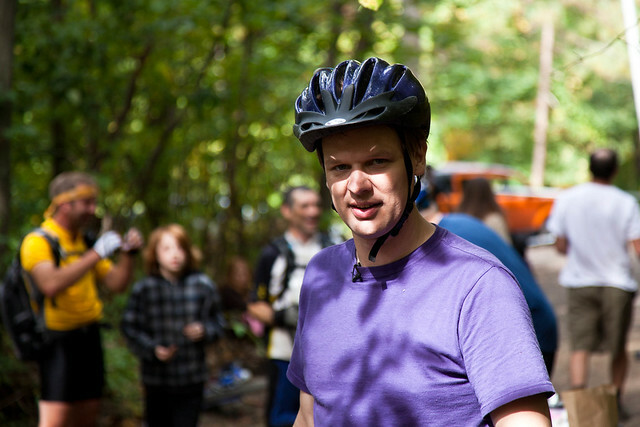 My friend Chrissy and I were on foot; needless to say, we had a tough time to actually find the riders in this 3.5 miles course in the woods. We tried so hard that we ultimately got lost, how sad is that? The park isn’t big by any stretch but I had no incentive to eat squirrels for lunch. My phone’s GPS came to the rescue and an hour later we found our way back to the finish line. Like tourists. 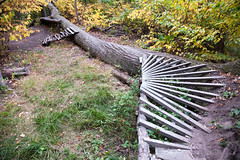 The video embedded above features a segment on a log. That would be me, of course, holding the camera while walking carefully (…and falling, I cut that part out, as I mentioned: no balance). 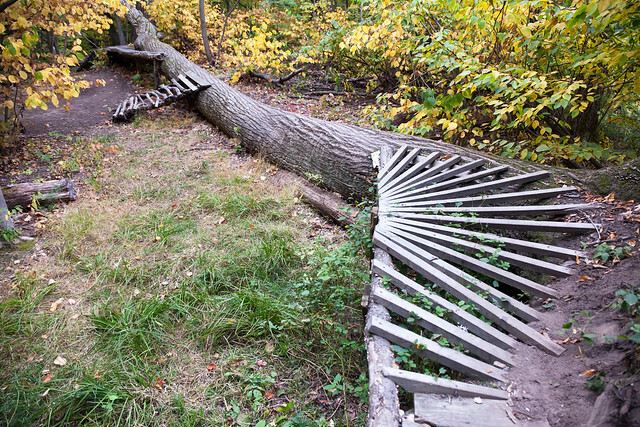 Below is a picture of the log, and part of the ramp. How does that sound? 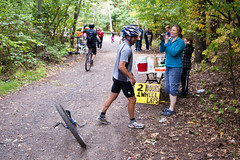 Piece of cake for unicyclist extraordinaire Roland K., as he demonstrates in this video below, shot in 2009. Wow. Roland is coincidentally the same guy who entertained us with hot peppers a few months earlier during the “Cooking the Tree of Life – Extreme Evolution” lecture at the NYS Museum. A badass scientist, no doubt. Some of these guys traveled coast-to-coast across Panama in January 2009. They blogged about their impressive 4 days trip; here is a map, a huge 29 mins movie and photos straight out of Uni Magazine (PDF). This jolly good fellow in the picture below learned a lot that day (according to him). 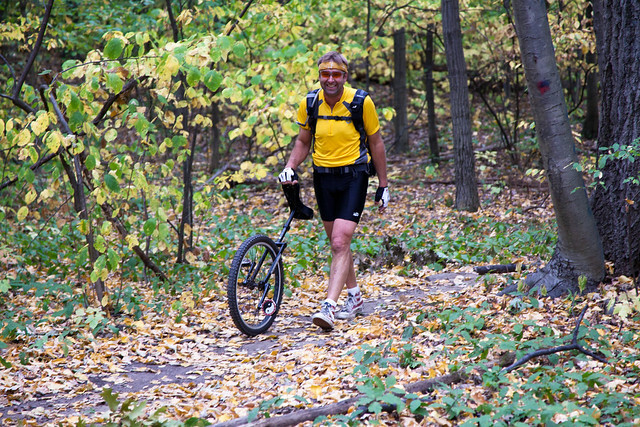 I saw him riding down a serious hill and keep that smile. The last video is a very comprehensive montage by MuniOrBust, shot from a GoPro camera attached directly to the unicycle. The “in between the legs” camera perspective is quite… unique. Feel free to check his blog. Tip of the hat to a guy working on a “ special treadmill that adjusts its speed to keep a unicycle in the center no matter what speed the rider is pedaling at ”. As if a treadmill wasn’t a deadly weapon already. 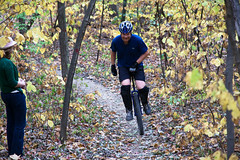 More photos on the unicyclist.com forum, post #52 and #60. And here he is above, only a few months before releasing thousands of U.S. State department diplomatic cables. I believe in you, Julian (wait, who remembers Julian Assange?). Finally, here is the race course recorded by Roland using his Garmin Forerunner: 3.21 miles in 00:37:41! The guy is fast. Thanks to all participants. Kudos to Roland K. for organizing this race. Thanks to All Over Albany for shining some light on all these unusual events. Keep up the great work. This entry was posted on Tuesday, December 7th, 2010 at 12:20 am and is filed under Sport. You can follow any responses to this entry through the RSS 2.0 feed. You can leave a response, or trackback from your own site. Fun read! Glad you included my video!